What’s green and orange and purple all over and tastes perfectly in season? 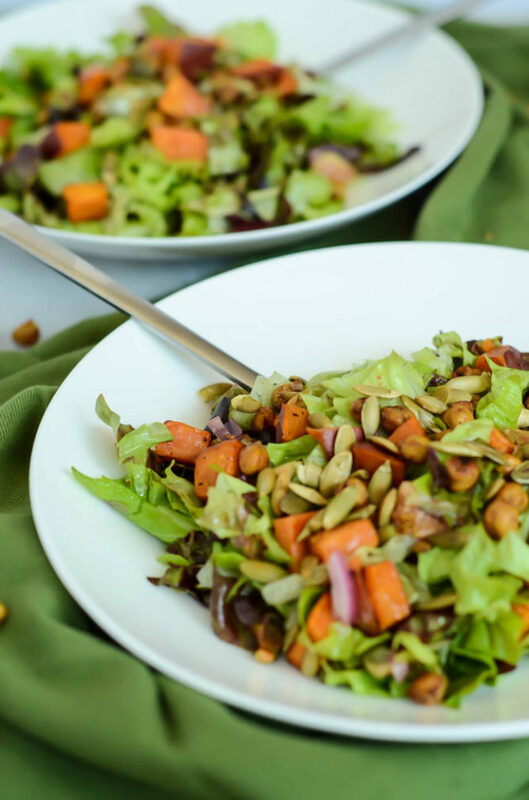 This Fall Harvest Chopped Salad with Apple Cider Vinaigrette! I know it’s not technically fall yet (just a few more days!) but after I took a little trip to the Farmer’s Market this past weekend I just couldn’t resist all of the fall produce I was seeing. Okay, maybe I just became obsessed with the fact that here in Santa Barbara we are deep in the throes of a very short fresh fig season, and I can’t help snatching a bunch of them up whenever I see them because I know they may be gone the next time I head out for groceries. So yes, this salad stars plenty of fresh figs, but it features so many other fun fall things as well. 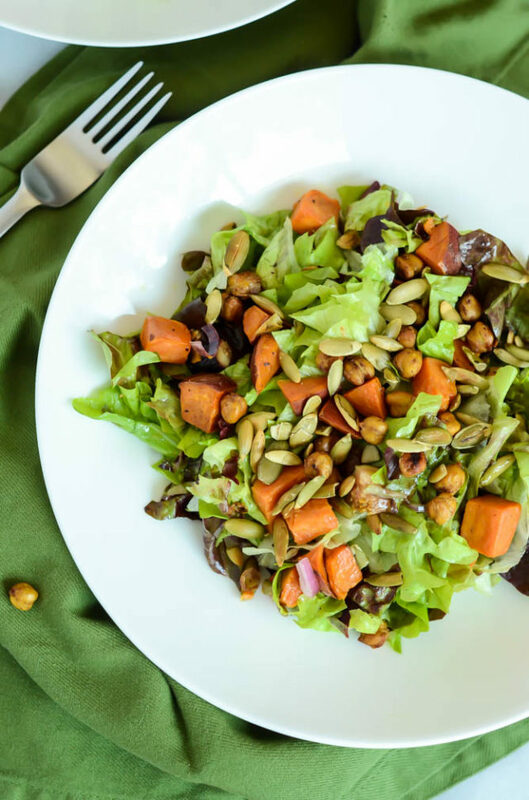 We’re talking sweet potatoes, pumpkin seeds (aka pepitas) and – wait for it – SAVORY PUMPKIN SPICE CHICKPEAS!! You guys, they’re amazing. Perfectly crispy with all that fun pumpkin spice flavor and then a savory hit of garlic. 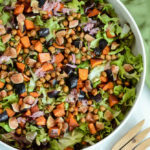 Even if you don’t make the entire Fall Harvest Chopped Salad, please, please, PLEASE make these savory pumpkin spice chickpeas for a healthy, protein-packed snack. You will not be able to get enough! And can we talk for a minute about chopped salads? I love salads served in this way (i.e. all of the ingredients already chopped up into bite-size pieces) for multiple reasons, mostly because (a) you can get a taste of every single ingredient in each bite and (b) you don’t have to worry about looking like a complete dinosaur with a giant piece of lettuce hanging out of your mouth when you try to take a bite. Easy to eat, full of flavor – that’s my kind of healthy meal! Usually I like to keep things simple with salads and keep the cooking to a minimum, but since we’re heading into fall I figured you wouldn’t mind just a little bit of oven/stove time to really make some of these flavors pop. 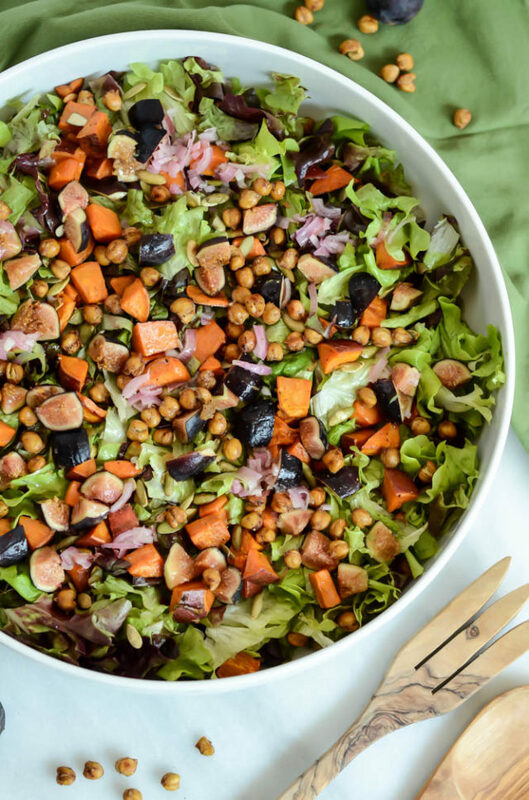 This Fall Harvest Chopped Salad with Apple Cider Vinaigrette is going to quickly become your go-to nutritious lunch or dinner for the season, and those savory pumpkin spice chickpeas are probably most definitely going to become your new favorite healthy snack. So let’s talk about what all exactly needs to go on here to make this salad come to life. The only oven time required is for roasting both our sweet potatoes and chickpeas, and the good news is that they can be roasted together, at the same oven temperature, for the same amount of time. How convenient is that? The only other “cooking” required is toasting up our pepitas, because if there’s one thing I learned during my time as a pastry assistant, it’s that you should be toasting your nuts WHENEVER you are adding them to any sort of recipe. It seriously adds so much flavor and is most definitely worth the extra 10 minutes or so of toasting over the stove. Aside from the roasting and toasting, all this Fall Harvest Chopped Salad requires is a good tossing in a huge bowl and a drizzle of shallot-tinged apple cider vinaigrette. And speaking of vinaigrette, this one couldn’t be easier. You may have noticed from the other salads I have here on the blog (like this Fall Kale Salad with Easy Balsamic Vinaigrette and this Fresh Fig and Burrata Salad with Toasted Hazelnuts) that I like to keep my dressings simple. I feel like you should really let all of the flavors of whatever produce and other goodies you’re using in the dish shine through and not coat it in a blanket of heavy, creamy, or otherwise overwhelming flavor. The apple cider vinaigrette we drizzle over this fall-forward salad adds the perfect touch of acidity (with a nice apple-y hint of flavor) while the shallots add an extra dimension to all of the other flavors in the mix. My only caution would be to wait and add the dressing right before serving. Since we’re using regular lettuce (as opposed to a heartier green like kale) it will wilt quickly if you leave it soaking in the dressing for too long. But that’s it! 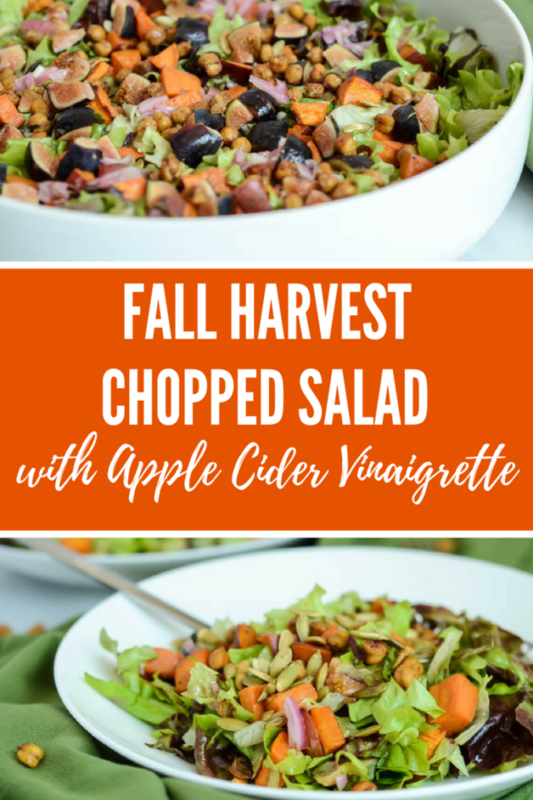 Having this Fall Harvest Chopped Salad with Apple Cider Vinaigrette prepped and ready for dinner tonight is not just a possibility, it’s a necessity! 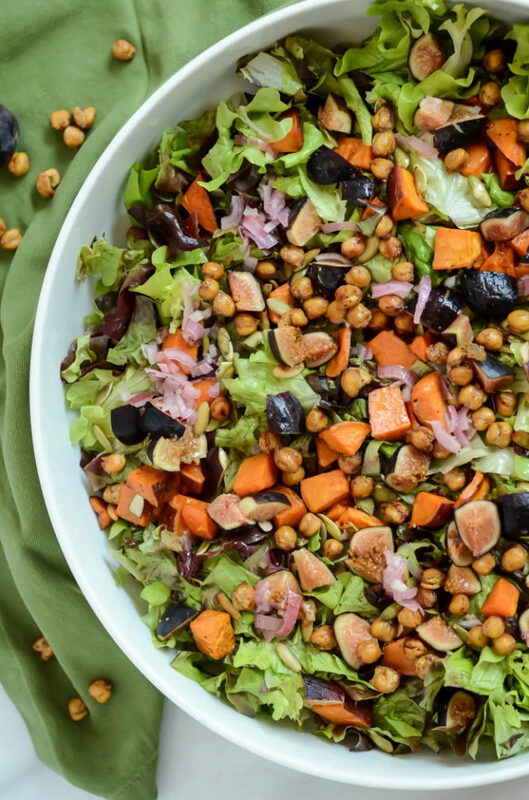 This seasonal, healthy salad is full of fresh figs, roasted sweet potatoes, toasted pumpkin seeds and savory pumpkin spice roasted chickpeas. Preheat the oven to 425 degrees Fahrenheit. In a small bowl, toss together all of the chickpea ingredients. Spread mixture over a small jelly roll pan. In a separate small baking dish, combine all of the roasted sweet potato ingredients. Place both the chickpeas and the sweet potato in the oven and roast for 20 minutes. 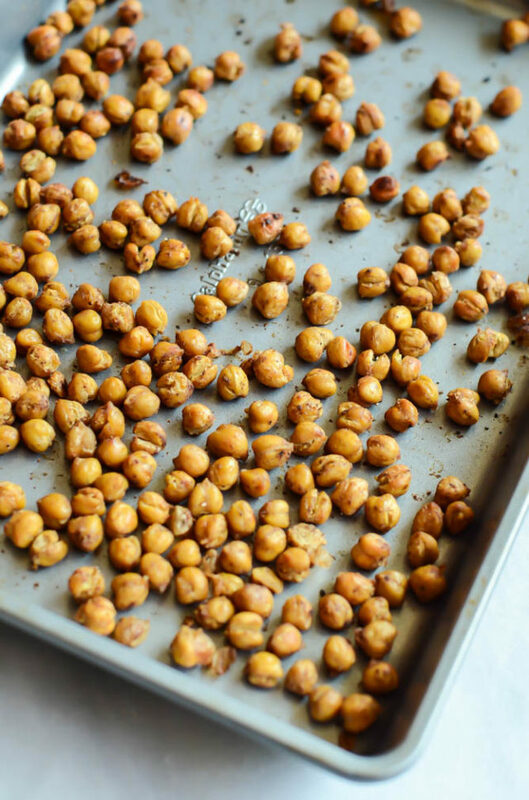 After 20 minutes, open the oven and give the chickpeas a little shake. Roast for an additional 15-20 minutes, or until the chickpeas are crunchy and the sweet potatoes are golden brown and fork tender. Remove and let cool while you prep the rest of the salad. Place the chopped lettuce in a large salad bowl. Add the figs, pumpkin seeds, sweet potato and chickpeas. Combine all vinaigrette ingredients in a Mason jar. Seal and give a good shake. Drizzle dressing over salad right before serving.